Designed with style and practicality in mind, the OSP Designs slat back dining chair is sure to be a great addition to any dining table. Complete with a white metal seat and white metal frame, this chair can withstand a busy, yet elegant home. This elegant slat back dining chair from !nspire is sure to bring an added dose of style to any dining room. Featuring a grey polyester/polyester blend seat and black metal frame, this chair is durable enough for a busy kitchen, yet elegant enough for a more formal setting. This beautiful parson dining chair from !nspire brings a touch of style and elegance to any dining room table. Its black leather seat and chrome metal frame give it an elegant, yet strong practicality that suits a variety of spaces. This beautiful slat back dining chair from Monarch Specialties brings a touch of style and elegance to any dining room table. Designed with a black faux leather seat and chrome leather metal frame, this chair can fit easily into a busy kitchen or a stylish dining area. Bristow Metal White Slat Back Armless Dining Chair with White Metal Seat - Set of 4 Designed with style and practicality in mind, the OSP Designs slat back dining chair is sure to be a great addition to any dining table. 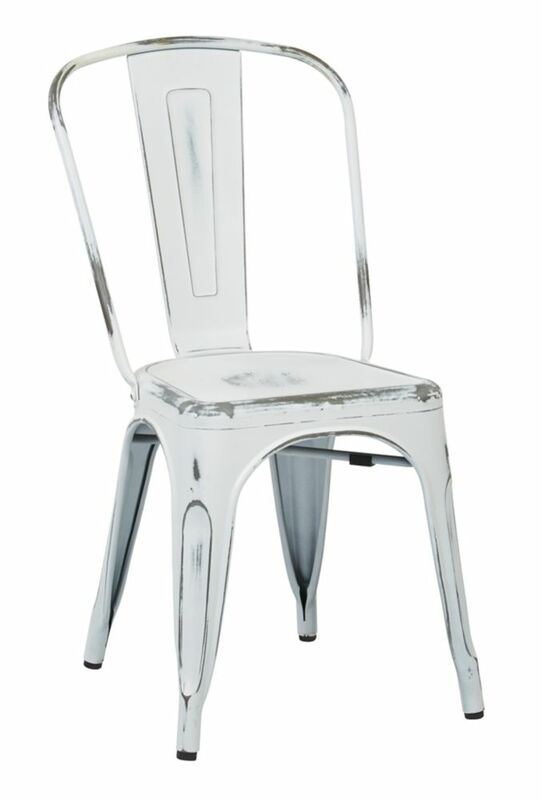 Complete with a white metal seat and white metal frame, this chair can withstand a busy, yet elegant home. Bristow Metal White Slat Back Armless Dining Chair with White Metal Seat - Set of 4 is rated 5.0 out of 5 by 3. Rated 5 out of 5 by Suzanne from It was exactly what it looked like on line. ... It was exactly what it looked like on line. I love them. They are strong and sturdy. Rated 5 out of 5 by Roxy from I love these chairs they really helped make my dining... I love these chairs they really helped make my dining room more farmhouse looking. They are also very comfortable to sit at.